It's well-known that a lot of artists don't write all of their own songs, and some don't write at all. Singing and songwriting are two very different skill sets, and just because you have a sterling set of pipes doesn't automatically make you a lyrical genius as well. In fact, before the "singer/songwriter" boom of the late '60s and early '70s, artists who wrote their own songs were the exception rather than the norm. Even the King of Rock and Roll, Elvis Presley, never wrote a song in his life. We know this because he said, "I never wrote a song in my life," which is tough to interpret any other way. Even when you can write, the possibility of making a cover song can have a strong allure, and you don't even need permission — just obtain a few licenses and pay a royalty, and you too can have your way with someone else's heartfelt creative expression. Like these artists did — they took existing tunes, pressed the "MAKE ICONIC" button, and delivered cover songs that have made the originals all but fade from memory. 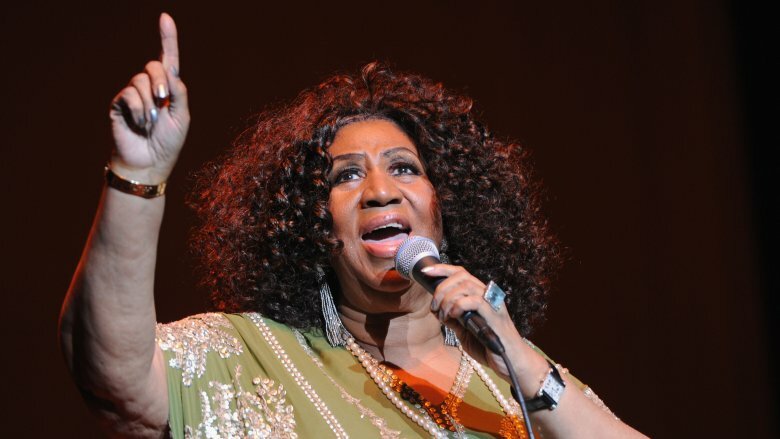 There was a massive outpouring of grief when Queen of Soul Aretha Franklin passed away in the summer of 2018 because she was an awesome lady and one of the very best vocalists of any type who ever walked the planet. Consider that in 1998, Luciano Pavarotti — one of the greatest opera singers of all time — fell ill before a scheduled performance of the aria "Nessun Dorma" on the Grammy Awards telecast. No sweat — Franklin stepped in to perform the extremely difficult piece in his place, and she killed it. If you're curious how many times anything like that has happened before or since, we direct you to the number zero. Everybody knows that "Respect" is the song that made Franklin a household name, but not so many are aware that the powerful feminist anthem was originally written and performed by a dude — and not just any dude, but the legendary soul singer Otis Redding. Of course, Franklin's version tweaked the lyrics significantly, altering the tune from a man's plea to his woman to not treat him like crap to a woman's plea to be recognized as an equal. She also added the iconic "R-E-S-P-E-C-T" breakdown and backup singer accompaniment, and the rest is history. Redding wasn't the biggest fan; he introduced his version at the Monterey Pop Festival with, "This is a song a girl took away from me," which just kind of seems … disrespectful. If you've ever heard of Robert Hazard, chances are you grew up in Philadelphia. The rocker never had much success outside his hometown, despite catching some national buzz with his song "Escalators of Life" and opening up for the likes of the Motels and U2 in the early '80s. But one song from his 1981 5-track EP went on to a bit of a second life — a bouncy, reggae-inspired tune he dashed off in 20 minutes while taking a shower. The manager of an up-and-coming young singer named Cyndi Lauper came across "Girls Just Wanna Have Fun" while searching for material for her debut album She's So Unusual, and despite the fact that it was written from the point of view of a girl-crazy dude, Lauper immediately saw its potential. With Hazard's blessing, she reworked the lyrics into a call for feminine solidarity and fun-having, and promptly scored a #2 hit with it in 1984. The tune that originally sported lyrics detailing the inner thoughts of a total skeev went on to inspire women of all ages for the next three decades; speaking with Yahoo, Lauper said, "Now I see three generations of women in my audiences. And when we start to perform 'Girls' — wow, you can't beat that, and that's why I never get tired of singing that song live." Dolly Parton is a country music legend, and one of the most prolific songwriters in popular music. She's written over 3,000 songs, and perhaps her greatest work was inspired by Porter Wagoner, the man who gave her her big break. He invited Parton to be a regular performer on his country music TV show in 1967, and six years later, she was ready to say goodbye. As a touching tribute, she wrote "I Will Always Love You," bringing Wagoner to tears when she performed it for him. "Okay, you can go," he reportedly said, "but I'm producing that damn song." It was a gigantic hit, going straight to #1 on the country charts — and when she re-recorded it for the soundtrack to 1982's Best Little Whorehouse in Texas, it went to #1 again. But a funny thing happened during the production of 1992's The Bodyguard — Kevin Costner and his secretary got hold of the song, and loved it. Parton approved of its use in the film, but didn't receive word as to whether it would actually appear … until she heard Whitney Houston's version on the radio while driving, and "damn near wrecked [her] car." She knew immediately that Houston's version would eclipse her own, and she was right — it even imitated the original's feat by shooting to #1 once in 1992, and again after Houston's death in 2009. As the sole songwriter, Parton receives royalties for the tune — one of the best-selling singles ever — to this day. English rockers After the Fire were a band that literally nobody in the United States would ever have heard of if they hadn't adopted a supremely risky strategy for breaking into the U.S. market: covering an unknown song by an Austrian rapper. Falco (who would later tear up the American and international charts with "Rock Me Amadeus") had himself a significant European club hit with "Der Kommissar," a sketchy crime story about a drugged-up couple on the run from the local sheriff. But being unable to get his foot in the door stateside, he encouraged any and all English-speaking bands to cover his tune, and After the Fire heeded the call. The cover song featured badly translated lyrics sung in an impenetrable accent by lead singer Andy Searcy (example: Falco's succinct "Tell him your life is killing you" became Searcy's "Just say your life is gonna make you die,") but also featured super-slick production and a killer arrangement built around the original's earworm-y guitar riff. Helped along by a video which MTV played roughly every ten minutes, it peaked at #4 on the Billboard charts and was so popular that it dragged Falco's version onto the charts alongside it. Many '80s music fans may not even remember that it was a cover, but Falco had the last laugh. While After the Fire did a quick fade into ultra-obscurity, he became perhaps the best-selling Austrian pop singer in history. In 2002, Nine Inch Nails mastermind Trent Reznor was just hanging out when he received a call from superproducer Rick Rubin, because stone-cold legends can just call each other up like that. Rubin was in the middle of a three-album project with yet another legend, country superstar Johnny Cash, and wanted to know if Reznor would be cool with Cash covering "Hurt" — one of Reznor's most personal songs. Reznor said he'd be flattered, then forgot about it until he got a tape in the mail two weeks later. "Hearing it was like someone kissing your girlfriend," Reznor remembered. "It felt invasive." Shortly after, he received a DVD containing Cash's iconic video — and any and all doubt went out the window. "We were in the studio, getting ready to work and I popped it in," Reznor said. "By the end I was really on the verge of tears. … There was just dead silence. There was, like, this moist clearing of our throats and then, 'Uh, okay, let's get some coffee.'" Like the Devil that time he went down to Georgia, Reznor knew he'd been beat. While the original is a fine song, Cash had turned it into an anguished summary of his entire life, which would be over a mere seven months after the video was shot. Today, Reznor considers the cover to be a greater honor than any award he's ever received, because who wouldn't? Of all the bands to get unfairly pigeonholed as '80s bands simply because they were active in that decade, perhaps none have more reason to grouse about it than Tears for Fears. Sure, many of their hits were early MTV staples, and they used synthesizers and had weird hair. But the group's two primary members, Roland Olzabal and Curt Smith, wrote thoughtful, elegant songs whose accessible pop sound belied their depth of meaning. Just look at "Mad World," a 1983 single which began life as an almost disco-sounding, uptempo tune that features some of the most pessimistic, depressing lyrics of all time. The version with which you're probably familiar was recorded in 2001 by journeyman singer/songwriter Gary Jules, who was recruited by his friend Michael Andrews, who had been hired to score the cult classic Donnie Darko for next to no money. Andrews laid down the somber piano track, Jules sang the vocal, and the pair banged out the cover — which leaned heavily into the song's depressing elements, and would play over an equally depressing montage near the film's end — in just 90 minutes. When the film's popularity started to snowball, so did the song's — and the cover ended up spending nine weeks on the U.S. charts. By contrast, the original was never even released as a single in the States — proving that Americans like their existential angst straight and unfiltered, thank you very much. Back before Lauryn Hill started to come completely off the rails, she was the most promising talent in a group full of them. The Fugees' 1996 sophomore release The Score was great big ol' hit, and Hill proved that her vocal talents went much further than rapping with the single "Killing Me Softly," a hip-hop-ified cover of the famous Roberta Flack tune. Except that's not exactly right — Flack's version was itself a cover, and it pretty much derailed the career of Lori Lieberman, the woman who originally wrote and recorded it. Lieberman recalled in a Huffington Post interview that she was inspired to write the tune after seeing Don McLean (the American Pie guy) performing at a nightclub. "When he sang 'Empty Chairs,' I felt exposed — as though he were singing about me and my life. It felt as though he was singing straight to me. As the audience filtered out of the club, I wrote a poem on a napkin." Songwriter Norman Gimbel helped her flesh out the song, which became her debut single and began climbing the charts — only to be stopped cold by Flack's more lavishly-produced version, which she had apparently recorded approximately thirty seconds after hearing the original. Five unassuming years later, Lieberman was out of music, and a recent comeback attempt has been stymied by the fact that nobody knows who she is. Thanks a bunch, Roberta Flack. The tragic ballad "Last Kiss," about a teen girl who tragically dies in a tragic car crash (it's all very tragic), was a #2 hit for seminal grunge band Pearl Jam in 1999, quite awhile after the genre had lost its grunginess. The song's throwback sound loudly announced it as a cover, and while Pearl Jam's version is certainly the most popular, the story behind the original(s) is super-interesting and, well, tragic. The tune was penned by Wayne Cochran, who based it on the real-life story of a pair of teens killed in a car crash on a rural road near his Georgia home. He released it as a regional single in the early '60s, but the tune didn't get any traction nationally until it was picked up by J. Frank Wilson and the Cavaliers, whose cover version was a top ten hit. Four months after its release, the band was touring in Ohio when their manager fell asleep at the wheel. The car smacked a trailer truck head-on, killing the manager instantly and injuring Wilson, who appeared onstage on crutches just a week later to sing his hit song about a fatal car crash. The song would then languish in obscurity for over 30 years, until Eddie Vedder picked up a copy in a Seattle antique store and became obsessed with it. Unbelievably, the tune turned out to be Pearl Jam's biggest U.S. hit — confirming that old adage that tragedy plus time equals boatloads of money. "Walk This Way" is a classic Aerosmith tune, but its cover version swiftly eclipsed it by virtue of being one of the most significant songs in all of popular music, maybe ever. The original's opening two-bar drum salvo had long been one of rap's most popular break beats, and Queens trio Run-D.M.C. were attempting to write a song around it for their breakthrough third album Raising Hell when fate intervened. Producer and noted longhair Rick Rubin suggested they do a straight cover instead, and as D.M.C. would later tell Rolling Stone, "We said, 'Motherf*cker, this is hillbilly gibberish, this is f*cking bullsh*t!" So the guys weren't totally on board at first. But then, Rubin remembered that the dudes from Aerosmith weren't really doing much, being about a decade into a serious commercial slump. He invited Joe Perry and Steven Tyler to come on down and lay guitar and vocal tracks, respectively, and their presence prompted Run-D.M.C. to step up their game. Somehow managing to sink their teeth into Tyler's hillbilly gibberish, they cut the tune that would turn them instantly from hungry up-and-comers to international superstars, become the lead single from rap's first platinum album, and literally bring Aerosmith back from the dead. Along with the Beastie Boys' similarly rock-tinged "(You Gotta) Fight for Your Right (To Party)," the song catapulted rap into the mainstream consciousness. It also spawned several dozen ill-advised rock-rap collaborations, but we can forgive it for that. Singer Alan Merrill of British band The Arrows wrote his band's most enduring tune as a sort of rebuttal to the Rolling Stones' "It's Only Rock and Roll," which he had seen the band perform on Top of the Pops. He felt the song was apologizing for rock, to which his knee-jerk response was, "Screw you, I love rock and roll." A light bulb then appeared over his head, and he dashed off a song with that very title (minus the "screw you" part). Unfortunately, the Arrows were clashing with their label at the time. The song was relegated to a B-side and didn't even chart. But the band's performance of the tune on the TV series Pop 45 so impressed producers that they threw down their hats and yelled, "Get these lads their own variety series!" Which they did, and it lasted for two full seasons between 1976 and '77. Of course, they hauled out "I Love Rock and Roll" for one of the first episodes, and a young Joan Jett happened to catch the show while on tour in the U.K. with her band the Runaways. Years later, Jett would cover the song with her new outfit the Blackhearts for their 1981 sophomore album — also titled I Love Rock 'n Roll — and score a #1 smash hit with it. It just might be the most successful cover of all time.